The ladies have really stepped it up this week. Their previous record on eggs was 25 a week, and this week they layed seven more, upping that record to 32! The most interesting thing is the Easter Eggers are hardly laying at all yet. 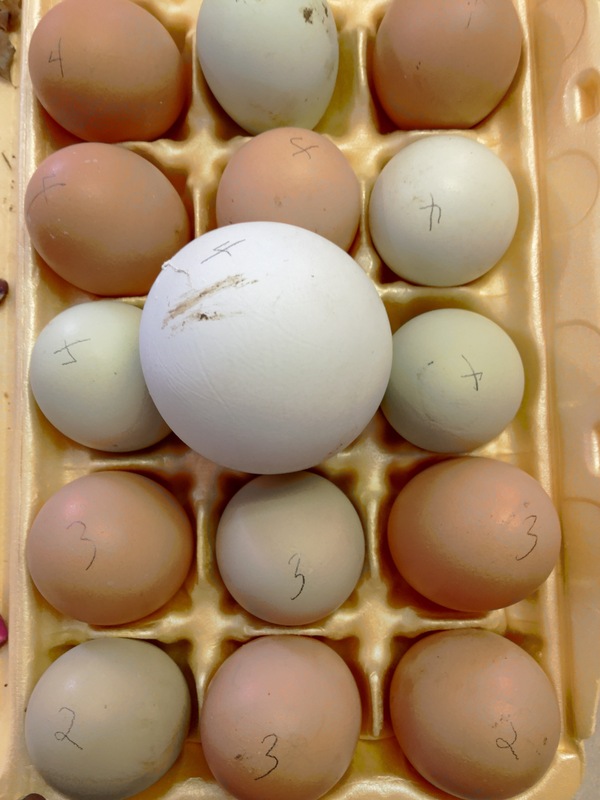 They are only averaging 2.3 eggs a week per bird, and once they are laying at full capacity this should be around 5 eggs a week per bird. Oh, I do have an egg pic to share this week. This is from their record day of SEVEN EGGS! Seven eggs! This is the most we have gotten in a single day to this point. Even though the run is secure, we have always locked the ladies in their coop at the end of the day. I figure that this is an added layer of security if a raccoon or opossum gets into the run during the night. Well, about a week or so ago we found two birds hanging out below the coop in the run when we went down to let them out in the morning! These two ladies had presumably suffered all night outside of the coop. Determined this would never happen again, we have been diligently watching for this at night. Well, on Saturday night when we went down to shut the door, there were two of the Easter Eggers sleeping on a roosting pole in the run! Those silly ladies! We ended up leaving the door open that night, but going forward we will pull that roosting pole out toward the end of the day to prevent this from happening again. The ladies are getting more brave. I might have mentioned this last week, but I will say it here again. In the past, they would stay all together and relatively close to the run when we let them out to stretch their wings and eat some grass. In fact, let me back up. In the beginning, we would move them from the run to a dog cage, where they could get fresh grass, but be protected. 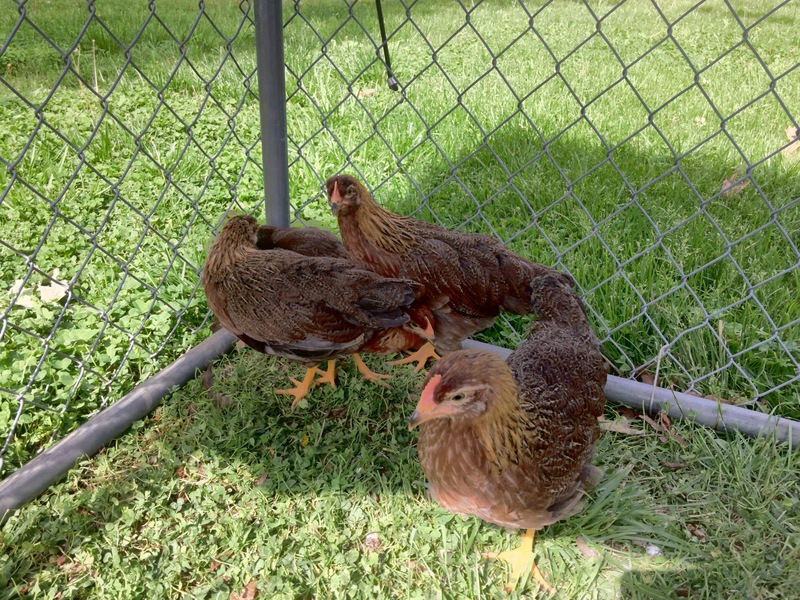 As soon as we were confident that they could take care of themselves, we began letting them run in the yard, but what did they do? They ran to the dog cage! Finally they got past that, and then they would all hang close to the run together. Then they started wandering a little further away, but generally together. Now they are going all over the back yard, and sometimes they are going solo. It’s nice to see them getting more brave, but it also makes it harder to round them up to go back in the run. WOW! 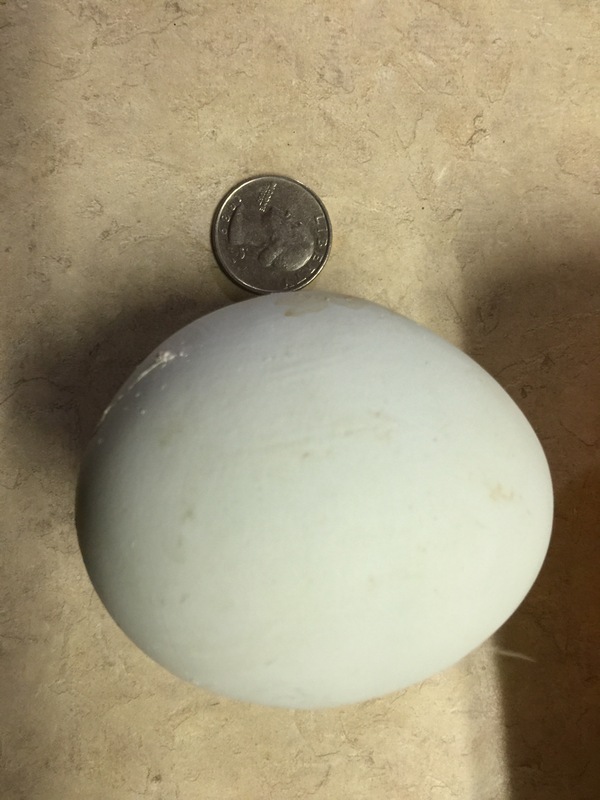 I can’t tell you how excited I was yesterday to find out that we had not just one more egg (see: My Surprise for the Day), but THREE MORE EGGS! 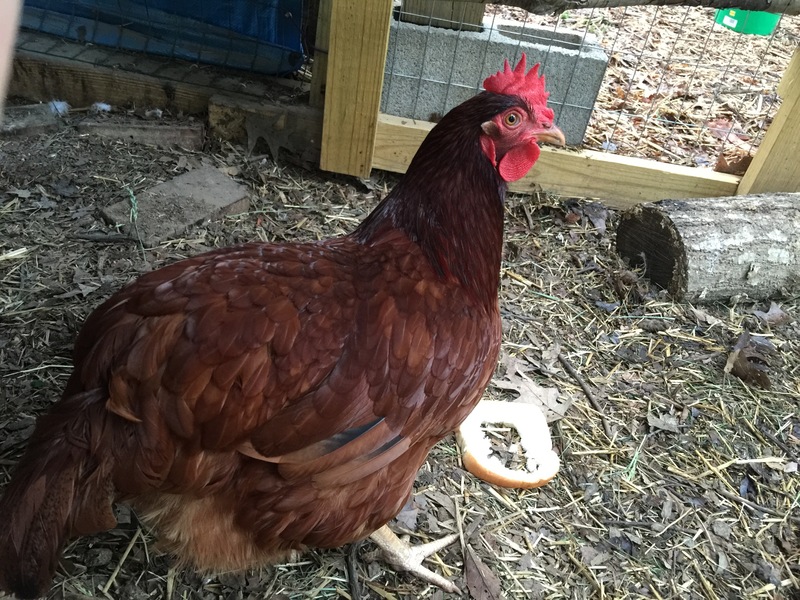 Not only that, but one of the Easter Eggers, we believe it was Blondie, laid an egg! Henry Ford, referring to the Model T, reportedly once said, “Any customer can have a car painted any color that he wants so long as it is black.” That is much like eggs, isn’t it? Almost all of them are white, though the stores have found ways to upsell anything brown in color. 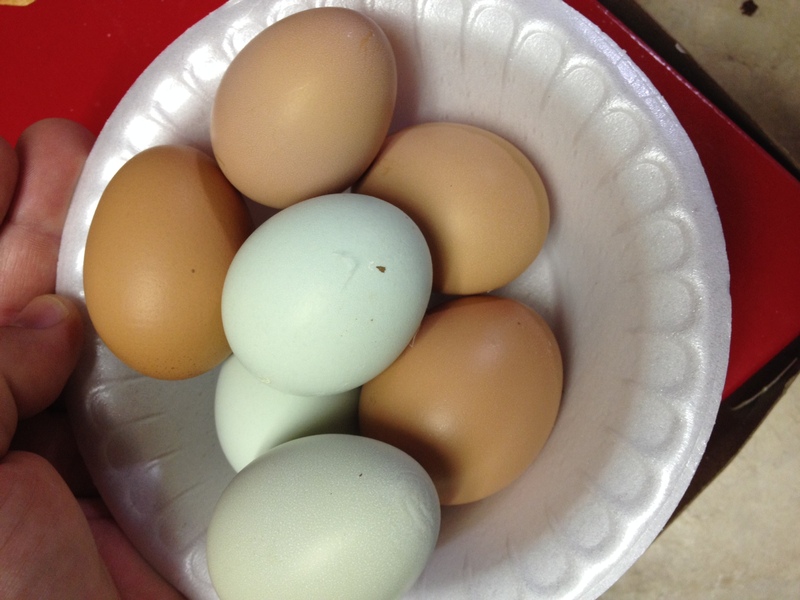 The one thing that I haven’t seen in the stores yet, however, is a blue/green shade of egg. Even so, there are breeds of chickens which lay this color naturally. 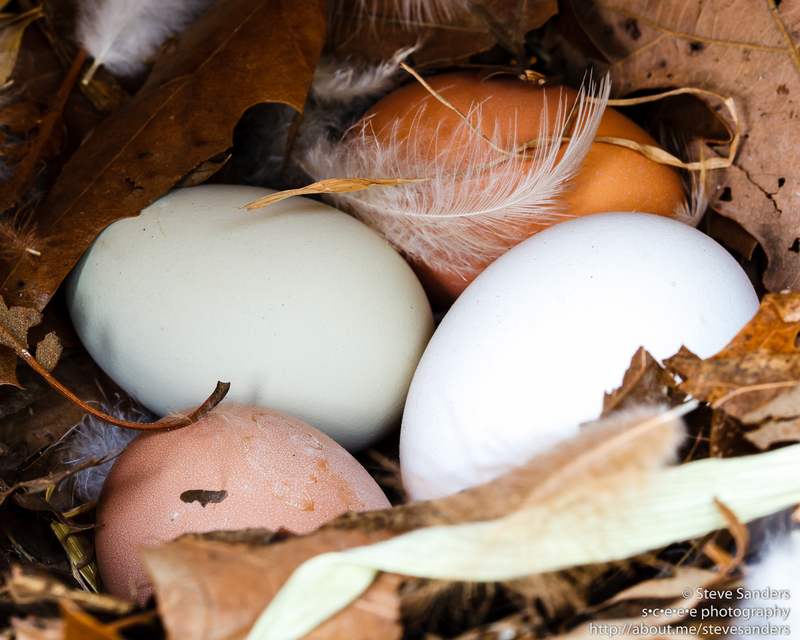 You will notice four eggs in the picture, the largest of which is a store-bought, large, white egg that I placed in one of the laying boxes to encourage the chickens to lay there. The other three, however, were all from yesterday. The one at the 7:00 position in the picture looks identical to the one yesterday in color and size. The next one going clockwise, at about the 10:00 position, is the first Easter Egger egg. The next one going clockwise is perhaps a little smaller than the other ones, and it is a little more elongated. I would say all three are similar in size to a small store-bought egg. If I understand it right, there are probably three hens laying right now, one of which has layed two days in a row. I expect all three will now start giving 5-7 eggs a week, or a total of 15-21 eggs a week. The other seven hens should start laying soon, perhaps more will even lay today. My family thinks I am a complete dork, but I am so excited about this.